Washington D.C. Metro area businesses have many options for commercial Internet plans. A local Google search of the 2,500 registered Internet providers in the U.S reveals more than two dozen options in the DC Metro region, including global Internet Service Providers (ISPs), national ISPs, and regional ISPs. There are also options for fiber, enterprise-class Internet, business-class Internet, small business-Internet, high-speed Internet, and much more. As you’ve certainly noticed, there’s almost no standardization in the industry when it comes to Internet plans. While one company offers the lowest prices, does their package come with enough bandwidth or a service level agreement? Is the rock-bottom pricing offer shrouded in hidden fees? Price doesn’t always equal value among commercial Internet service providers. There are a number of factors that influence the cost of commercial Internet. Cost is definitely calculated based on your bandwidth and speed needs. You may need to pay for installation. However, some ISPs don’t guarantee advertised speeds or offer service-level agreements as part of their commercial connectivity packages. Fortunately, we’ll show you how to evaluate commercial Internet plans and pick an option that boosts your business with sufficient speed and bandwidth at the right price. First, are you looking at fiber plans or copper or coax cable Internet-based plans on an ISP’s website? There are many differences between these service types, and fiber generally offers speed, bandwidth, security, reliability, and long-term cost savings advantages. If you want fiber, understand whether it is indeed available at your location. It’s important to note that some providers advertise high-speed commercial Internet solutions that appear to be fiber, but aren’t. Light, Moderate or Heavy Usage: Apps, file sizes, and the types of data you transmit can influence how much bandwidth and speed you need. If you serve up multimedia data, this can push you into “moderate” or “heavy” usage. Using cloud services for payroll, training, CRM and procurement drive heavy usage, too. Concurrent Heavy Usage: Note if you have many users who transfer large data files at the same time, such as multiple video conferences going on simultaneously. Can you tolerate downtime? Probably not, but some organizations and industries--such as healthcare or public education--consider 100% uptime to be mandatory. Even if you’re not in these industries, organizations who use cloud apps or databases can absorb high costs from poor reliability. Learn more in How Much Does Fiber Internet Cost in Washington D.C.
There’s much more that goes into choosing the right business Internet access provider. If your organization requires enterprise-class connectivity and a full-suite of unified-communications-as-a-service, you’ll likely need to get personalized quotes from vendors. For any organization shopping for an ISP, you should evaluate reviews and expertise. Check whether they offer 24/7 live, expert support. However, the factors above are a good starting point for narrowing down service plans. 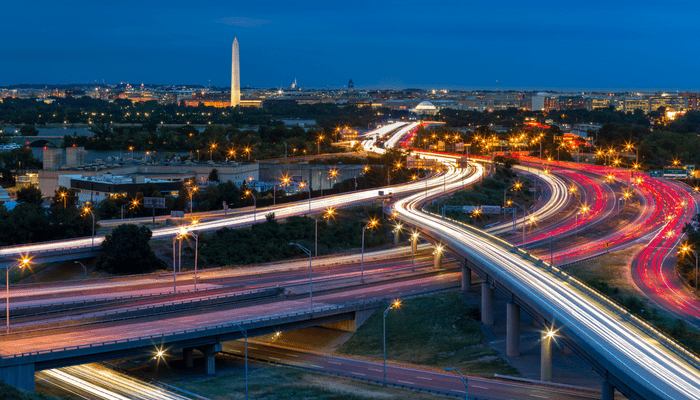 Using the factors we outlined above, here’s a brief break-down of several options for commercial Internet connectivity in the greater DC metro area. This is not a comprehensive list of local ISPs with commercial service offerings, but it’s a starter. This plan is for copper-based Internet connectivity. However, fiber access is offered at some locations throughout the Washington D.C. Metro area. Shoppers can evaluate proximity online. Customizable. Speeds range from 4Mbps to “up to” 1 Gbps for “symmetrical Ethernet services,” which is equal upload and download speeds. Businesses can purchase asymmetrical Ethernet if their download needs exceed their upload needs. MegaPath has 99.99% guaranteed uptime, and the option to purchase proactive uptime monitoring for additional cost. Per MegaPath’s website, their service level agreement offers guarantees of 99.9% data delivery and a “mean time to restore,” or average restoration time of 4 hours during outages. Listed costs range from $219 per month for 3x3 Mbps to $359 monthly for 20x20 Mbps. This plan is for copper-based Internet, which Windstream refers to as “kinetic.” A Windstream map indicates some fiber availability in the DC Metro area. Customizable. Speeds up to 10 Gbps available, including symmetrically-fast upload and download speed options. 99.99% uptime, backed by a service-level agreement. Limited pricing data is available online, although the Windstream website indicates basic 25 Mbps of high-speed commercial Internet is regularly-priced at $79.99 per month. Fiber. Fios is currently available in D.C., though coverage is limited in surrounding metro area. The packages page did not mention service-level agreements, simply “high reliability.” Some money-back guarantee may be available. Customers can purchase priority tech support and expert tech support at an additional cost. Fios pricing ranges from $84.99 per month for 75 Mbps to $214.99 per month for 940 Mbps. The evaluated plans are based on coax Internet connectivity. The Internet packages are advertised as “fast” and “reliable,” but there is not advertised mention of service-level agreements. Customers have access to 24/7 customer support and a 30-day money-back guarantee. Currently, pricing ranges from $69.95 for 25 Mbps with a 2-year agreement to $499.95 for up to 1,000 Mbps with a 2-year agreement. However, website disclosures note this pricing reflects a limited-time sale, so prices may be subject to increase. Atlantech offers one of the most comprehensive fiber-optic networks in the Washington D.C. Metro area. Check your proximity to Atlantech’s fiber resources here. Fiber and Ethernet speeds available range from 10 Mbps to 10 Gbps. In addition, Atlantech Online has invested in reliability with self-healing, next-generation technology that’s capable of 10Tb/s throughput, industry-leading redundancy, and exceptional data security. Express: $100 monthly for 60/15 Mbps, first month free. Enterprise: $500 monthly for 100 Mbps, first month free. You can’t shop for commercial Internet connectivity by price alone. Bandwidth, speed, and cost also don’t give you the full picture. By digging deeper into 5 plans in the D.C. Metro area, it’s possible to understand that speeds advertised aren’t always guaranteed. At Atlantech Online, we believe that expert customer service and fast response to your troubleshooting questions is a right, not an optional add-on to your monthly service agreement. The service and quality promises you sign up for should be what you receive, without exception. Ready to become a more empowered commercial Internet buyer? 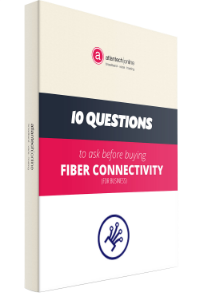 Download our free eBook: 10 Questions to Ask Before You Buy Fiber Internet for Your Business.